So I thought to myself there must be a way to make one myself. I drove to Lowe's and checked out their selection of acrylic sheets. For about $13 you can get a 1/4" thick acrylic sheet that is about 24"x 24" in size. You can then cut out the opening for your machine using a scroll saw. I didn't check but they might even be able to cut it for you there. Then you'd have to sand your cut edges smooth to prevent the fabric from getting caught. Some masking tape or blue painters tape on the edges would add some additional smoothness. Alternately you could look in the phone book and have a glass cutting place cut out the opening for you. I have yet to try this theory out but will let you know when I do. Probably sometime in February since the budget for this month has already been set and did not include a "sewing machine extension table." I might just end up doing it this way. I don't really see an advantage to a "clear" table. Another option would be to use wood shelving so that you can router your edges so they would be curved and smooth. My husband built my sewing counter attached to the wall of my sewing room. It wraps the corner so all my machines fit very nicely. It is 30 inches deep. 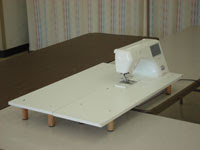 Embroidery machines and sergers sit on top. My Pfaff which I use for quilting, decorative stitches, and just sewing is recessed on a shelf below the counter. so that the sewing surface is flush with the counter. I made a paper pattern of the machine and purchased a piece of plexiglass 15 X 8 inches and cut it out to fit my machine and the "hole" it sits in. Everything is very snug and the plexiglass can be removed to to change bobbins, clean my machine and service it. It is extremely stable, no moving around or shaking. Ref: URL won't open. I found the referenced item at: http://tinyurl.com/ycd7tw2. However, the 'how-to' wording itself didn't make a lot of sense to me. I just wanted to encourage you to try the diy acrylic thingy.I don't quilt, so I didn't need the heavy duty extension, nor was it worth 50.00 of my recession surviving budget to purchase a commercial one. After visiting your blog, I dragged my handy boyfriend to Home Depot. We bought a medium thick piece of plexi out of the windows section. We also bought some wood blocks (we had them cut to the height I needed). He traced off the shape of my sewing plate "window" on the plexiglass and we had it cut at the hardware store (Lowes did it for free). I used blue painters tape to smooth the edges of the window/give it a shape that would make it more flush with my machine ( you may have to remove the free arm extension) and double sided mounting tape to attach the wooden block legs. It works great! All for less than 20.00 dollars (tape, plexi, and blocks included). It's plenty sturdy if you get a thick enough plexi and aren't sewing monster size quilts or heavy fur. Give it a try! If it doesn't work, it's a pretty cheap attempt all in all. The advantage of a plexiglass extension table over wood is you can pull it away from the sewing machine, put a light under it and use it as a light table to trace your art quilt pattern pieces. All you need is an extension cord with a light socket attached, and your extension table becomes multi-purpose.